There are many techniques available for interpolation of values in time series data (see Alexander (2008) for examples). This module describes the last know value (LKV) interpolation method with application to situations where price-volume data points are missing from a data set. Missing data could be due to errors in data collection, no trades occurring for a day or sequence of days, or the stock being suspended from trading for a period. As an example, the company 99 Wuxian Ltd (ASX code NNW.AX) was suspended from official quotation on the ASX from 18 November 2015 until its reinstatement to official quotation on 16 December 2015. The ASX Price-volume chart is in figure 1a, and open-high-low-close chart (described as a daily bar chart by the ASX) is in figure 2b. The last observed price of $0.105 is carried forward over the suspension of trading period, with an associated zero trading volume figure (as marked in the figure). This technique can be described as last known value interpolation. The value is carried forward in real time, without prior knowledge of the resumption of trading value. 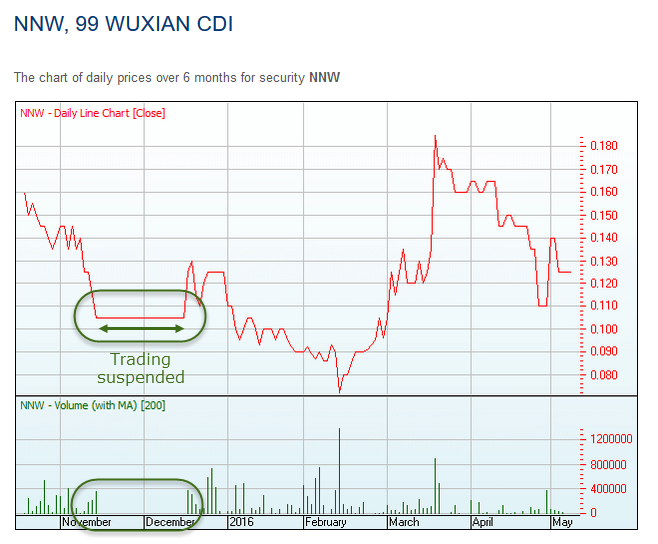 Fig 1a: 99 Wuxian Ltd (NNW.AX) - daily Price (Close) and Volume chart showing period of trading suspension. 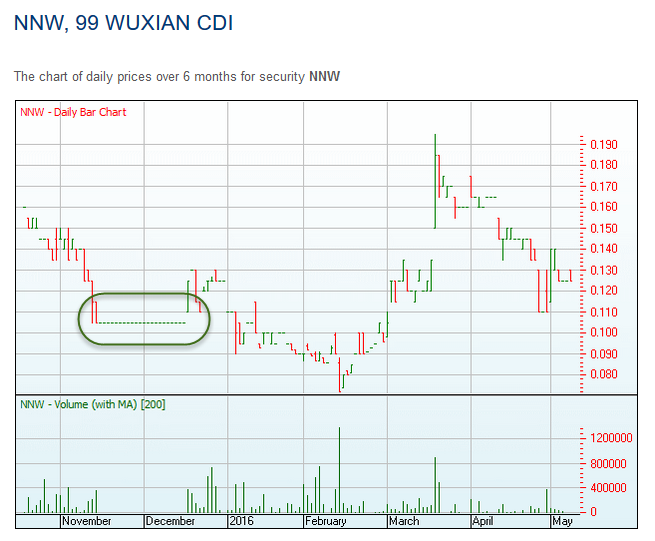 Fig 1b: 99 Wuxian Ltd (NNW.AX) - daily High Low chart with Nov 15 to Dec 15 suspension of trading. Depending on the specific reason for the suspension of trading, the last know price is often a good indicator of stock value for investors and other information users, because it is based on information known in the market place. See the animated graphic in figure 2 for an illustration of the LKV method. In the example, three data points are missing, so the last known value, $12 on 5 May 2016, is carried forward for the period 6 May 2016 to 10 May 2016. Note: LKV interpolation is described as forward-flat interpolation in NumXL time series add-in package. 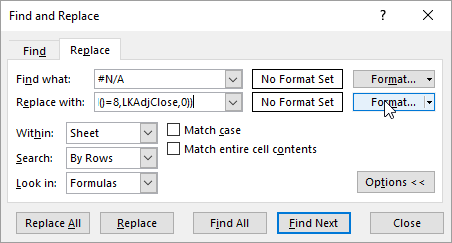 To implement LKV interpolation in Excel, we need to create some relative reference defined names, and use these in conjunction with the Excel Find and Replace feature. Using the LKOpen2AdjClose formula from point 5. 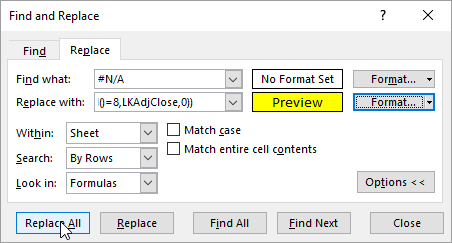 Click Replace All Alt A in figure 4d. 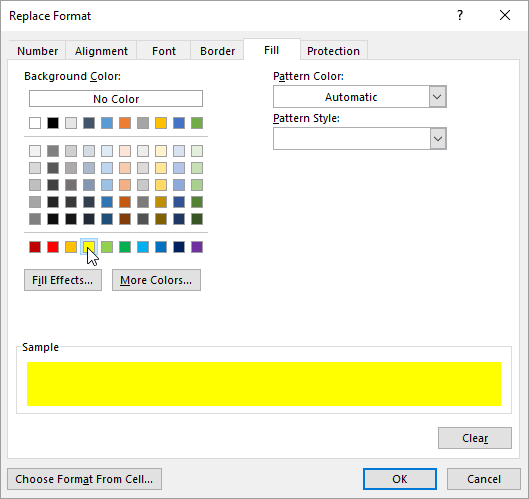 When completed, the message box in figure 5 will appear. Click OK. The interpolated data is in figure 6. Manually adjust the first row if necessary. Alexander C, (2008), "Quantitative Methods in Finance", Wiley.